True – False 1. 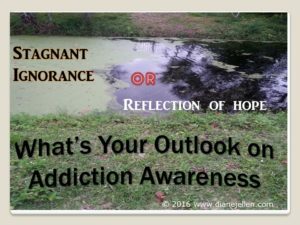 Addiction ignorance will eventually pollute our lives. True – False 2. Stagnant denial will contaminate our spirit. True – False 3. Addiction is a family disease. You may deny it for a while, but if you are honest with yourself, you will recognize and admit addiction infects all members of your family. Not there yet? Give it time. Alcoholism is a progressive disease. Like a slow spreading green slime in a once clear flowing stream, addiction will foul the behavior of family members. That brave person was me. And I truly believe that brave person is you! The most immediate response will be admitting we cannot fix, control, change, or clean up another person’s act. That mop-up process is theirs alone. Our job—take the steps needed to stop the spread of toxicity that threatens the peace of oursoul. Together, we can stop pretending everything is neat and clean. Our first step—sweeping away self-malice. This inner cleansing will begin when we replace our contaminated self-lies with maturity and wholeness instilled in us by our Higher Power. So clean house! Make a clean sweep of malice and pretense, envy and hurtful talk. You’ve had a taste of God. Now, like infants at the breast, drink deep of God’s pure kindness. Then you’ll grow up mature and whole in God (1 Peter 2: 1-3 MSG).